The five broadcast networks — ABC, CBS, The CW, FOX, and NBC — are releasing their plans for the upcoming Fall 2018 season. If you want to start planning what you’ll be watching each night this fall, check out the chart for the night-by-night schedule below. We’ll add dates as they become available. ABC Fall 2018 shows: 20/20, The Alec Baldwin Show (fka Sundays with Alec Baldwin), America’s Funniest Home Videos, American Housewife, Black-ish, Child Support, The Conners, Dancing with the Stars, Dancing with the Stars: Juniors, Fresh Off the Boat, The Goldbergs, The Good Doctor, Grey’s Anatomy, How to Get Away with Murder, The Kids Are Alright, A Million Little Things, Modern Family, The Rookie, Shark Tank, Single Parents, Speechless, Splitting Up Together, and Station 19. CBS Fall 2018 shows: 48 Hours, 60 Minutes, The Big Bang Theory, Blue Bloods, Bull, Criminal Minds, FBI, God Friended Me, Happy Together, Hawaii Five-0, MacGyver, Madam Secretary, Magnum PI, Mom, Murphy Brown, NCIS, NCIS: Los Angeles, NCIS: New Orleans, The Neighborhood, Seal Team, Survivor, SWAT, and Young Sheldon. The CW Fall 2018 shows: All American, Arrow, Black Lightning, Charmed, Crazy Ex-Girlfriend, DC’s Legends of Tomorrow, Dynasty, The Flash, Legacies, Riverdale, Supergirl, and Supernatural. FOX Fall 2018 shows: 9-1-1, Bob’s Burgers, Empire, Family Guy, Hell’s Kitchen, Last Man Standing, Lethal Weapon, Rel, Star, The Cool Kids, The Gifted, The Resident, and The Simpsons. NBC Fall 2018 shows: Blindspot, Chicago Fire, Chicago Med, Chicago PD, Dateline NBC, The Good Place, I Feel Bad, Law & Order: Special Victims Unit, Manifest, Midnight Texas, New Amsterdam, Saturday Night Live, Superstore, This Is Us, The Voice, and Will & Grace. 7/24/18 update: Chart updated with ABC’s Fall 2018 premiere dates. Click the links in the chart to see the info we have on each of the new and returning shows. Note: If you’re not seeing the chart, please try reloading the page. You can also view it and print it here. What do you think? Which shows will you be watching this Fall? Which timeslots are too crowded with TV shows you want to watch? 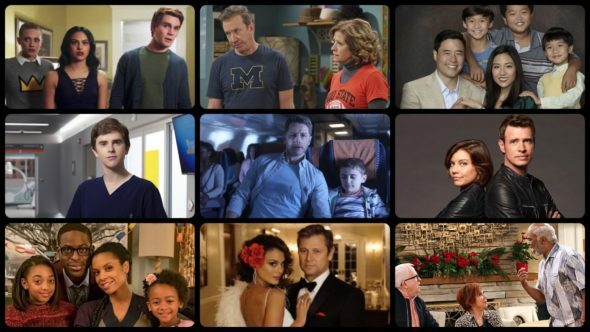 More about: 20/20, 20/20: canceled or renewed?, 48 Hours, 48 Hours: canceled or renewed?, 60 Minutes, 60 Minutes: canceled or renewed?, 9-1-1, 9-1-1: canceled or renewed?, A Million Little Things, A Million Little Things: canceled or renewed?, ABC TV shows: canceled or renewed?, All American, All American: canceled or renewed?, America's Funniest Home Videos, America's Funniest Home Videos: canceled or renewed?, American Housewife, American Housewife: canceled or renewed?, Arrow, Arrow: canceled or renewed?, Black Lightning, Black Lightning: canceled or renewed?, Black-ish, Black-ish: canceled or renewed?, Blindspot, Blindspot: canceled or renewed?, Blue Bloods, Blue Bloods: canceled or renewed?, Bob's Burgers, Bob's Burgers: canceled or renewed?, Bull, Bull: canceled or renewed?, CBS TV shows: canceled or renewed?, Charmed (2018), Charmed (2018): canceled or renewed?, Chicago Fire, Chicago Fire: canceled or renewed?, Chicago Med, Chicago Med: canceled or renewed?, Chicago PD, Chicago PD: canceled or renewed?, Child Support, Child Support: canceled or renewed?, Crazy Ex-Girlfriend, Crazy Ex-Girlfriend: canceled or renewed?, Criminal Minds, Criminal Minds: canceled or renewed?, Dancing with the Stars, Dancing with the Stars: canceled or renewed?, Dancing with the Stars: Juniors, Dancing with the Stars: Juniors: canceled or renewed?, Dateline NBC, Dateline NBC: canceled or renewed?, DC's Legends of Tomorrow, DC's Legends of Tomorrow: canceled or renewed?, Dynasty (2017), Dynasty (2017): canceled or renewed?, Empire, Empire: canceled or renewed?, Family Guy, Family Guy: canceled or renewed?, FBI, FBI: canceled or renewed?, FOX TV shows: canceled or renewed?, Fresh Off The Boat, Fresh Off The Boat: canceled or renewed?, God Friended Me, God Friended Me: canceled or renewed?, Grey's Anatomy, Grey's Anatomy: canceled or renewed?, Happy Together, Happy Together: canceled or renewed?, Hawaii Five-0 (2010), Hawaii Five-0 (2010): canceled or renewed?, Hell's Kitchen, Hell's Kitchen: canceled or renewed?, How to Get Away with Murder, How to Get Away with Murder: canceled or renewed?, I Feel Bad, I Feel Bad: canceled or renewed?, Last Man Standing, Last Man Standing: canceled or renewed?, Law & Order: Special Victims Unit, Law & Order: Special Victims Unit: canceled or renewed?, Legacies, Legacies: canceled or renewed?, Lethal Weapon, Lethal Weapon: canceled or renewed?, MacGyver (2016), MacGyver (2016): canceled or renewed?, Madam Secretary, Madam Secretary: canceled or renewed?, Magnum PI (2018), Magnum PI (2018): canceled or renewed?, Manifest, Manifest: canceled or renewed?, Midnight Texas, Midnight Texas: canceled or renewed?, Modern Family, Modern Family: canceled or renewed?, Mom, Mom: canceled or renewed?, Murphy Brown, Murphy Brown: canceled or renewed?, NBC TV shows: canceled or renewed?, NCIS, NCIS: canceled or renewed?, NCIS: Los Angeles, NCIS: Los Angeles: canceled or renewed?, NCIS: New Orleans, NCIS: New Orleans: canceled or renewed?, New Amsterdam (2018), New Amsterdam (2018): canceled or renewed?, Rel, Rel: canceled or renewed?, Riverdale, Riverdale: canceled or renewed?, Roseanne, Roseanne: canceled or renewed?, Saturday Night Live, Saturday Night Live: canceled or renewed?, SEAL Team, SEAL Team: canceled or renewed?, Shark Tank, Shark Tank: canceled or renewed?, Single Parents, Single Parents: canceled or renewed?, Speechless, Speechless: canceled or renewed?, Splitting Up Together, Splitting Up Together: canceled or renewed?, Star, Star: canceled or renewed?, Station 19, Station 19: canceled or renewed?, Supergirl, Supergirl: canceled or renewed?, Supernatural, Supernatural: canceled or renewed?, Superstore, Superstore: canceled or renewed?, Survivor, Survivor: canceled or renewed?, SWAT, SWAT: canceled or renewed?, The Alec Baldwin Show, The Alec Baldwin Show: canceled or renewed?, The Big Bang Theory, The Big Bang Theory: canceled or renewed?, The Conners, The Conners: canceled or renewed?, The Cool Kids, The Cool Kids: canceled or renewed?, The Flash (2014), The Flash (2014): canceled or renewed?, The Gifted, The Gifted: canceled or renewed?, The Goldbergs, The Goldbergs: canceled or renewed?, The Good Doctor, The Good Doctor: canceled or renewed?, The Good Place, The Good Place: canceled or renewed?, The Kids Are Alright, The Kids Are Alright: canceled or renewed?, The Neighborhood, The Neighborhood: canceled or renewed?, The Resident, The Resident: canceled or renewed?, The Rookie, The Rookie: canceled or renewed?, The Simpsons, The Simpsons: canceled or renewed?, The Voice, The Voice: canceled or renewed?, This Is Us, This Is Us: canceled or renewed?, Will & Grace, Will & Grace: canceled or renewed?, Young Sheldon, Young Sheldon: canceled or renewed? What happened to the show about a White House Assistant that had an affair with POTUS and his wife found out , stripped everything from the Assistant and she had to return to her poor small town trailer park home. I can’t remember the name of the show or who starred in it. Too Close to Call on TLC. It was cancelled. You can use the search box for more details. I feel That ABCs Conners should not be given a second season at all on Tuesday night at 8:00 pm I am so sick of watching The Conners on ABC I prefer to watch ABCs American Housewife on Tuesday night at 8:00 pm than ABCs The Conners The Conners should be considered going to a different network like CBS or Fox if they accept The Conners from ABC. On BET last season, I watched the first season of a show called,” In Contempt.” It was excellent. Now I can’t find out any info about if it is being renewed, or being cancelled. Anyone heard anything? Why OH why is Superstore still being produced? I would love for you to bring back Jag on CBS. Was absolutely one of the best shows for 10 years and can be again as long as you have David James Elliott and Catherine bell. I am having one hell of a time to fitnd IDIOT TEST..there is no info for 2018 what up? Who do the networks pick to rate shows? Some to the best shows I’ve ever seen have been canceled and then they revive some of the crappiest shows ( the gong show, bewitched) just to name a couple. I’m now going to Netflix and fire tv so I can at least watch better shows. Are the networks trying to get people to go somewhere else? I agree also. And so many of the new shows have to throw politics into a comedy or sitcom. Really! I’m there to laugh and enjoy the show, not listen to some other persons political point of view. I hear enough of that every day on the news. We don’t want politics we want good quality shows or we won’t watch. Absolutely! T.V.is supposed to inform and entertain. What we have now is partisan preaching coupled with moronic one-liner sit-coms, and/or ridiculously gratuitous graphic language and violence. What ever happened to unbiased straight forward news reporting and actual wit in sit-coms or thought provoking drama that is without an insistance on forcing only one pooint of view on us. We can actually think for ourselves . . . or we used to. I agree Courtney the shows today are mostly CRAP shows. I too have gone to Netflix. I rather stream good shows than pay for bad ones. ABC, NBC, and CBS are no longer top TV channels. I agree there are shows on I really enjoy watching and you’ve taken off ones I watched regularly that was liked. I know ratings of a show make a difference. Night shift was one show. I don’t know if there was a remake of “Bewitched”, if there is/was I didn’t watch it. I loved the original show only. Audience TV, Fall 2018 – Has NYPD BLUE been discontinued or on at a different time than weekdays, 6 p.m., EST? So your prime time starts at 7pm? Just subtract an hour from the schedule times. they were certainly not thinking about the viewers who enjoyed it on Network Tv. it did ? So we cant pick it up unless we have Netflix? that is madness!! I thought it was cancelled.